Away from the hustle and bustle of the Nugegoda metropolis, a 20 minute drive towards the Pita-Kotte junction leads the way to Kotte Raja Maha Vihara, one of the ancient temples of the city. The tranquillity of the temple invited us for a journey towards a life full of peace and happiness. Since it was almost twilight, the temple was crowded with many worshippers. The light of the oil lamps and the aroma of the incense sticks took us to an incredible world, making us forget that we are at the edge of a busy town. "When King Parakumbha VI (1415-1467) ruled the country, he built this temple closer to his palace, with the intention of doing the necessary duties to the Sangha regularly," the Chief Incumbent of the Kotte Raja Maha Vihara, Ven. Aluthnuwara Anuruddha Thera explained. With the arrival of the Portuguese, the Kotte Kingdom faced a tragic situation. The fate of the temple was no difference. It was in 1813, when Ven. Pilane Dharma Keerthi Sri Buddha Rakkhitha Thera found this ancient temple in ruins and restored it to the present condition. "The Thera found the place, with some ruins of the present Chethiya, foundation of the Vihara and the Katharagama Devalaya, and some stone pillars here and there," said Anuruddha Thera. "However, most of the artifacts had been taken away by the foreigners leaving only a few ruins at this place," he lamented. 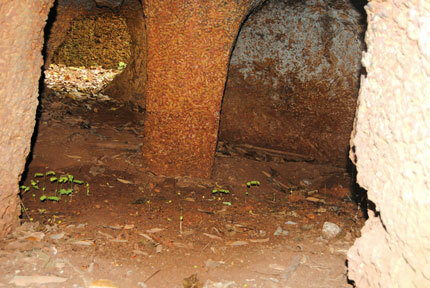 A kabok tunnel situated at the Kotte Ananda Shasthralaya premises is another important artefact that belongs to the temple. This tunnel has three openings. One doorway leads to the palace and another to escape safely during an enemy attack. 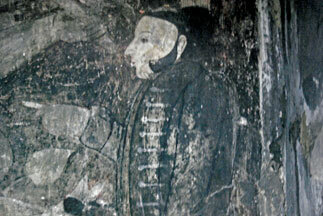 It is noticeable that during the past the entrance to the tunnel had been decorated with a 'Makara Thorana'. The outline of the decoration still remains at the doorway. It is said that there was another tunnel connected to this one. That is for the purpose of enabling the Queen and her maids safely reach the other nearby temples. A bronze plate kept at the temple, with the engraving 'vaasala' (palace), is one of the historic artifacts found at this premises. It is said that this plate was sent from the palace during alms-givings. Now the plate is restored at the Vihara. The 'Viharage' of the temple has many ancient drawings and one of the old 'Devala' contains a drawing of a Portuguese Mudliyar or a soldier, with a bronze-buttoned shirt, a sarong with some designs, and a hat. One of the wall paintings depicts this Portuguese man holding a bird and a devil dancing nearby and another show the Mudliyar pointing a finger at something. The paintings are almost vanishing. It gives some signs of colour, however, now it is visible in black and white. 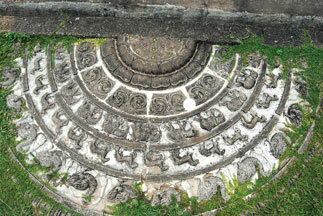 The Sandakadapahana or the moonstone of the temple is adorned with swans, horses, elephants, and leaves (liyavel). The centre of the moonstone is decorated with some coloured glass beads, to give the effect of the seeds of the lotus. The land towards the east of the temple is another important part of the ancient temple. 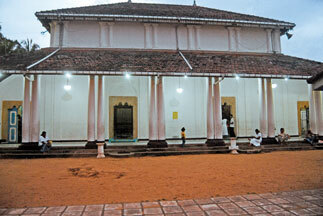 It had been a place named 'Kota Vehera', a place that was worshipped by the kings, ministers as well as the public. 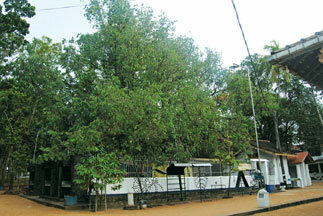 Unlike other temples, this temple has an ironwood (Na) tree instead of a bo tree. 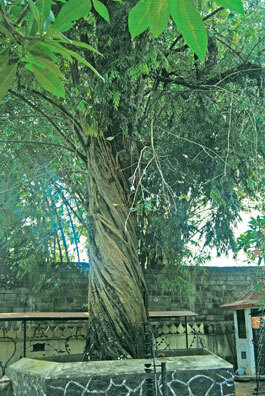 History of this tree dates back to the era of the prince Sapumal Bandara, the prince who defeated Aryachakravarthis and won the administration of Jaffna. Before leaving for this war, he had worshipped this ancient naa tree and made a vow. He returned to Kotte as a winner and national hero. From that day onwards, people had the habit of worshipping the tree before attending any of their major tasks. 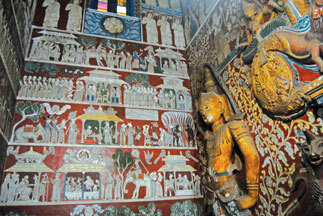 The kings during that era paid a visit to the temple after their coronation ceremony to pay homage to the Buddha. H. C. P. Bell an Archaeological Commissioner of Ceylon once said, "At the village of Pita-Kotte, which consisted of the outer city stood the Dagaba and temple to which according to tradition, before the coronation the monarchs of Kotte used to ride on horseback for the ceremony of cutting the tali-pot tree that sprang into life again like the golden bough of Virgil with student of each successive ruler. 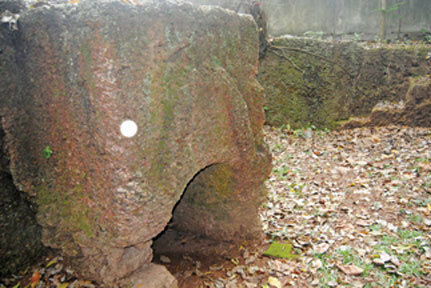 The temple had vanished centuries ago, with the other Buddhist buildings. The Dagaba, which had remained in facet, spaced alike by conqueror and by time, has recently been exploited and the bricks of the dome daily abstracted to build a house. Now, only the basement is left of it, and that too is fast disappearing"
"Later this land was handed over to a mission by the Dutch," says Anuruddha Thera. "They cut off the Bo-tree and built a church on that place," He added. To date, the main temple of the Kotte Vihara does not have a Bo-tree. The area with the Bo-Tree is situated a few metres away from the main temple. C.M. de Silva states in his book 'Antiquities of the Kingdom of Kotte', "The Rajamaha Vihara is the meeting point of thousands of devotees from all parts of the neighbouring towns and villages. The perehera of the temple is viewed with a spirit of devotion and happiness evoking a sense of national pride is perpetuation a historic event of the bygone days of Kotte." Explaining further he wrote, "The Rajamaha Vihara in Pita-Kotte was constructed by Sri Parakramabahu VI about the year 1415. For the upkeep of the temple, considerable lands yielding and the King had endowed adequate income. Under the Portuguese rule the temple was reduced to ruins and for nearly one and a half centuries the palace was under the jungle." According to the Department of Archaeology, there is no other place in the country like Kotte, where most of the ancient buildings, artefacts, and ruins were lost. The chief incumbent of the temple, humbly requests the public to present voluntarily whatever the artefact they have, which is related to the history of the temple. It would be a social service for the betterment of the future generations.